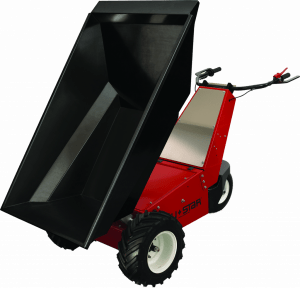 The Power Pusher E-750 Electric Wheelbarrow is designed to safely and easily transport loads weighing up to 1000 pounds. Available with a galvanized steel tub or heavy-duty, high-density poly tub, the wheelbarrow improves safety and efficiency by eliminating ergonomic challenges and unnecessary production delays that are associated with manually operated wheelbarrows. Designed to minimize strain, the E-750 provides push-button powered dump capability. It is the perfect piece of equipment for construction, demolition, landscape, farms and more with multiple standard and custom attachments available.